Dr. Evans is pleased to be living and serving the Reno community. He has been working in Reno since 2009. He grew up in Visalia, CA near Sequoia National Park and has always loved the Sierra Nevada Mountains. He and his family enjoy snow skiing, biking, four-wheeling trips, and hiking in the mountains around Reno. He loves to talk with his patients about all of these activities. Dr. Evans has his CPA license and practiced for 6 years before deciding to go back to dental school. He attended Pacific Union College and Loma Linda University. Dr. Evans’ professional memberships include the American Dental Association (ADA), the Nevada Dental Association (NDA), the Northern Nevada Dental Society (NNDS), the American Academy of Implant Dentistry (AAID), the Academy of General Dentistry (AGD), Pierre Fauchard Academy, and the American Academy for Oral Systemic Health (AAOSH). Dr. Evans is excited to have joined his father-in-law here in Reno. 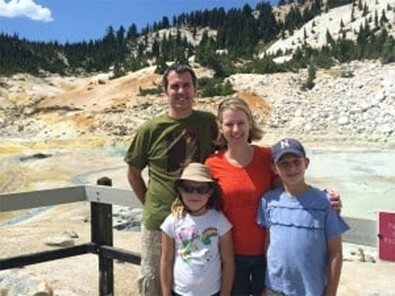 His wife, April, and their two young children are happy to have returned to Reno and be near family, as well as skiing, biking, and clear blue skies. Dr. Evans looks forward to a long career serving the wonderful people of Reno.